It may be small, occupying less than a quarter-mile stretch of Highway 98, but Downtown Fort Walton Beach is big on ways to occupy your time – rain or shine. Whatever the weather, good times are in the forecast when you visit this quaint and quirky downtown to dine, shop and play. Felicia McQuaid, who has offered services in the area since 2007, establishing The Healing Clinic on Brooks Street in 2013, encourages visitors to take a break from the beach to see what downtown has to offer. With more than 20 dining options tucked along the Miracle Strip Parkway, it would be miraculous if you couldn’t find one you like. There’s seafood and salads, Italian and Irish fare … if you’re reluctant to abandon your lounge chair, there’s even a sandy beach just off the sidewalk. KC’s SandBar & Grill is home to the “only beach in the city,” serving up Sno Balls and sandwiches on a white sand open-air courtyard fit for families and fraternizers alike. Behind the main drag on Brooks Street sit Ali’s Bistro and Magnolia Grill, each blending modern menus and historic charm to pique your curiosity and your palate. If a hot or cold brew is what pleases you, check out Maas Coffee Roasters for a pick-me-up or nearby Coasters for a pint. No matter your taste, Downtown Fort Walton Beach brings the flavor. For an expanded list of restaurant recommendations, visit the Downtown Fort Walton Beach website. Step away from the giant box stores touting their T-shirts and free hermit crabs. 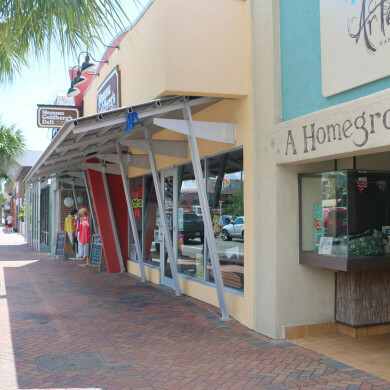 If you want a real souvenir, head to the Downtown FWB shopping district, where handmade treasures and antiques abound. Deck yourself out for life on deck at Liz Fashions or The Closet Swap, a high-end resale boutique. Sparkle like the sun setting over the Gulf with a trip to Artesano Jewels. Peruse an extensive display of collectibles and memorabilia at Buccaneer Gift Shop, or take home local artwork from Full Circle Gallery or NWFLAA Art Lair. Bike. Skate. Run. Paint. Stroll. Namaste. Repeat. Downtown FWB caters to most any hobby under the Gulf Coast sun, with an array of specialty stores geared to get you going. Ready to roll? Check out Bob’s Bicycles, Fluid Surf Shop or Liquid Surf and Sail. Feeling artsy? Pick your paintbrush at Splash Paint Party Studio. If your toes in the sand need a new pair of trainers, Run With It has got what you need. Or, strike a pose at either Hot Yoga Om or Dragonfly Yoga. After you sweat it out, center yourself at The Healing Clinic of Fort Walton Beach. Catch a film at Cinema Plus, then let Brava Hair Studio & Day Spa and make you feel like a movie star. At the end of the day, kick back and relax at The Landing, a waterside park where the kids can play while you watch the dolphins cruise by. Downtown FWB also plays host to an annual calendar of events. To see what’s happening while you’re in town, visit the Downtown Fort Walton Beach website. You probably came to Fort Walton Beach for, well, the beach – but it’s worth the short trek downtown to learn what this place is all about. Downtown FWB may take up just a tiny footprint along the Florida coast, but it’s sure to make a lasting impression.